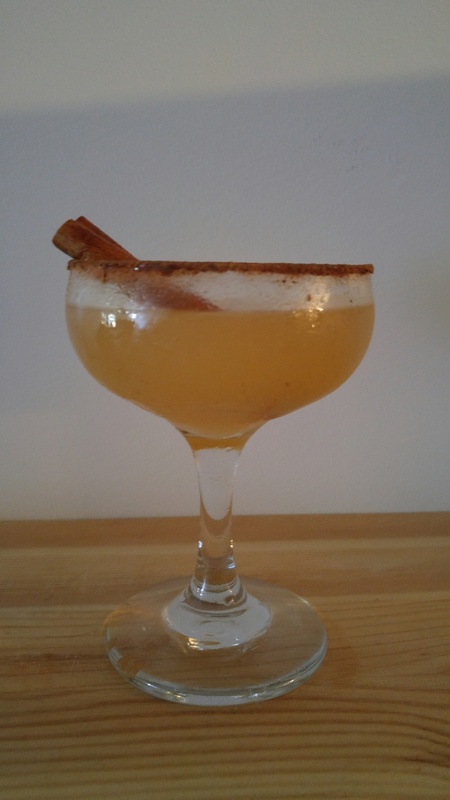 Apple butter is a lovely addition to this twist on a margarita. Method: Rim a coupe glass with ground cinnamon and sea salt powder, set aside. In a cocktail shaker, combine tequila with apple butter, lemon juice and agave nectar, then shake with ice. Strain the contents into the coupe glass and garnish with a cinnamon stick. You can see the glow as you cross the zoo bridge from Inglewood to St. Patrick’s Island. Bright, multi-coloured lanterns in the shape of animals and plants illuminate the night inside the Calgary Zoo. 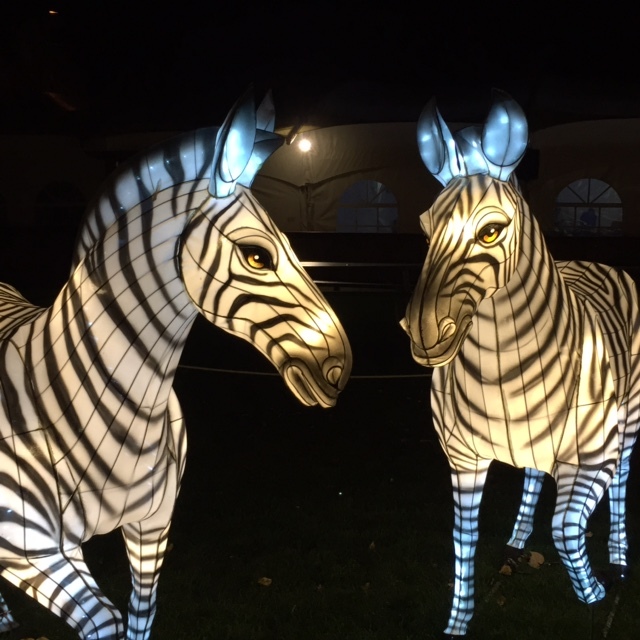 They beckon to moms like me — whose kids love the zoo — to come and see the Illuminasia Lantern & Garden Festival, running through Nov. 1, 2015. Illuminasia features 366 plant- and animal-shaped lanterns from China. 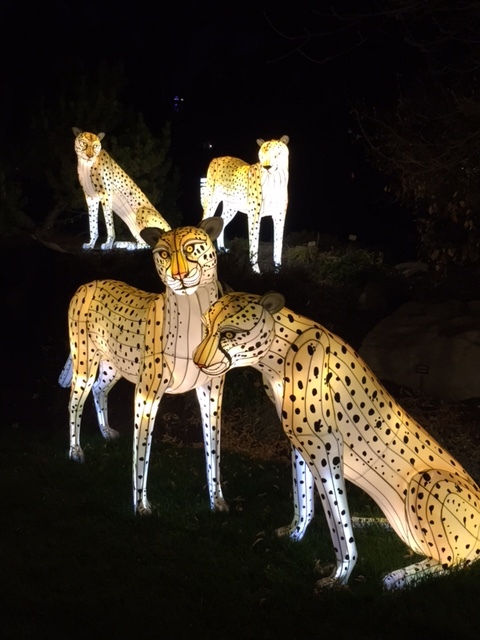 We’ve been big fans of Zoolights for years, so I was eager to see how this shoulder-season event — designed to attract visitors during a non-peak time of year — stacked up. As luck would have it, I was invited to check it out by the Travel Media Association of Canada (I’m a member) for a great price, but it was an adult media mixer so I left the kids at home. 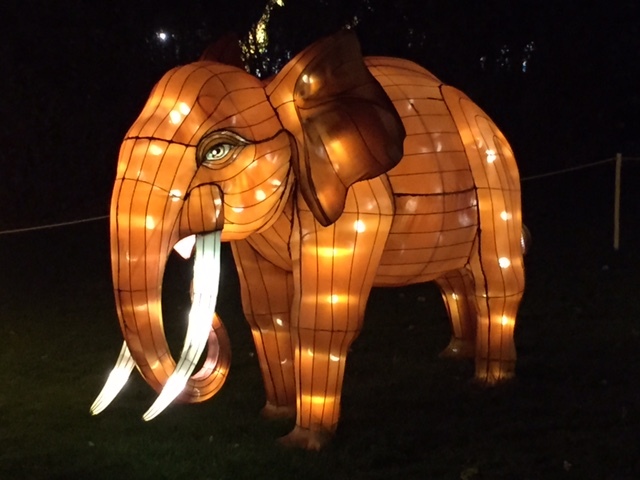 Illuminasia features 366 lanterns (183 plants and 183 animals) of varying sizes built in China and then shipped 12,000 km to Calgary. The lanterns are made of a silk-rayon fabric that’s been stretched over a frame, with details such as stripes (tigers) or facial expressions (check out the zebras!) airbrushed or hand-painted on. 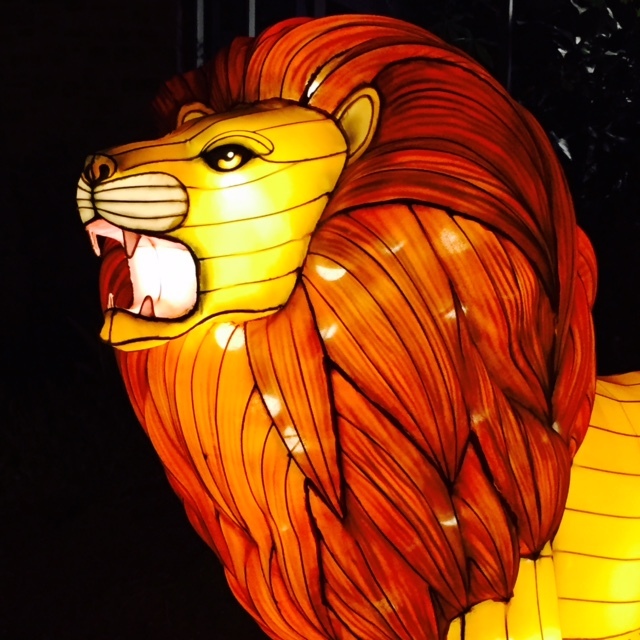 Some of the Calgary Zoo’s Illuminasia lanterns, like this lion, almost look like they’re made of glass. Very cool. We walked past delicate cheetahs, a fierce roaring lion, hunting velociraptors, a giant moose and a flock of flamingos, among many others — all animals that are represented at the Calgary Zoo (the zoo obviously doesn’t have real dinosaurs but rather features animatronic giant reptiles in its Dinosaurs Alive exhibit). A favourite are the panda lanterns, likely because the zoo is gearing up to welcome real giant pandas in 2018. 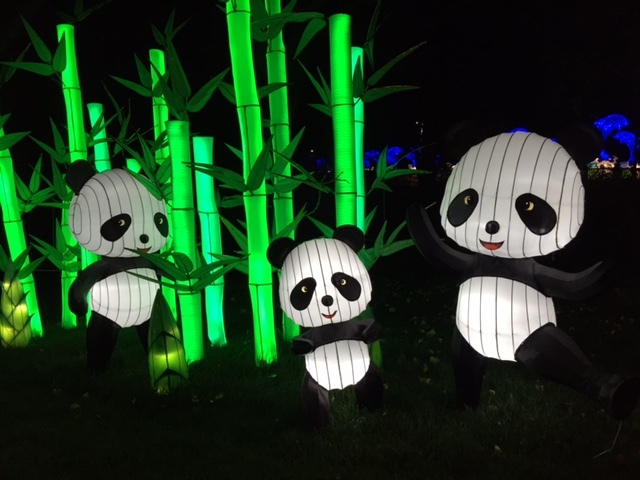 The pandas are the most popular lanterns at the Calgary Zoo’s Illuminasia festival. In addition to the lantern walk, Illuminasia features programming tied in to themes that celebrate different countries in Asia. Experience India, for example, runs through Oct. 25 and offers a chance to see a performance by Bollywood-style dancers (free), or the opportunity to get a henna tattoo or make a block art print ($10). Colourful elephants add flair to Illuminasia at the Calgary Zoo. I’m all for the zoo enriching its programming and thinking of creative ways to broaden the zoo experience (now that Avery and Bennett are older, there are only so many times a year we want to go see all of the usual animal suspects). I only wish the zoo would make these extra offerings more accessible. For a family of four to go to Illuminasia it costs $84 (note: it’s $76 for regular zoo admission for two adults and two kids), plus $5 parking. And it’s not like you can pull a twofer take in the lanterns and the real animals at the same time, since the lanterns turn on at 7 p.m. but by then it’s too dark to see the animals and/or the animal buildings are closed. There is a discount on Illuminasia tickets offered for Engage or Inspire level zoo members (20 or 25 percent, respectively, plus free parking), but, for comparison’s sake, the member discount price still works out to be more than regular Stampede admission (which is $54 for a family of four). It seems like a lot of money to look at lit-up animals, and I can’t help but think that by lowering prices or offering more member incentives, events like this would attract a lot more people and ultimately earn the zoo more money. I liked Illuminasia, but the cost might leave you feeling cheetah-ed. So the question is, will I bring Avery and Bennett to Illuminasia before it wraps up for the season on Nov. 1? I really liked it, but for $84 for our family, I’d have to say no (we are no longer zoo members now that the children are older). Yes, we pay for Zoolights every year, but for us that’s become a Christmas Eve tradition so we don’t mind the cost. The zoo has plans to make Illuminasia an annual event, so perhaps it too will eventually become a tradition. Time will tell. In Calgary, there seems to be a new restaurant opening up every week. With all the buzz about the latest next-best-thing, I sometimes forget about long-standing favourites. Fortunately, the oldies-but-goodies find new ways to lure back the regulars, as I discovered during a recent happy hour at Divino Wine & Cheese Bistro. The Stephen Avenue mainstay has launched a new happy hour program (Mon.-Fri. from 3-6 p.m.) that pairs a cellar gem with something delicious and cheesy. 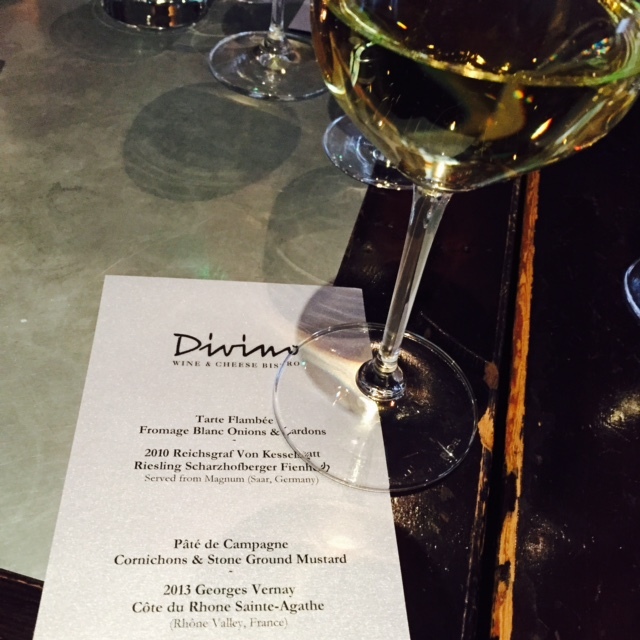 Divino’s new happy hour program pairs cellar sips with delicious nibbles. 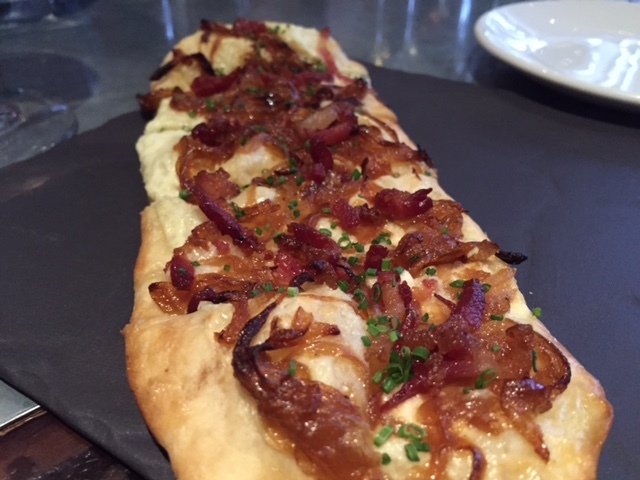 For example, I sipped a crisp 2010 Reichsgraf Von Kesselstatt Riesling from Germany ($9) in between nibbles of a savoury “tart flambé” ($6) with caramelized onions (a kind of fancy share pizza). It’s not a pizza; it’s better! And at $6, great value, too. Fear not, cocktail lovers. Divino also features a small but enticing cocktail list. Try the Kitten Belly ($14), a seasonal sip with Calvados, rose lemonade, apple drinking vinegars, lemon and egg white. Divine! The leaves are just past their peak, hinting at cold weather to come, but this sweet stretch of Indian summer calls for a gin and tonic! I propose this lovely berry twist on the classic, with a handful of mint from your outdoor planter before a killing frost claims it. The G&T taste of summer transitions to fall with the addition of Creme de Cassis. Method: In a tall glass, muddle mint leaves with lime and Creme de Cassis. Add gin, fill the glass with ice, then top with tonic. Stir. 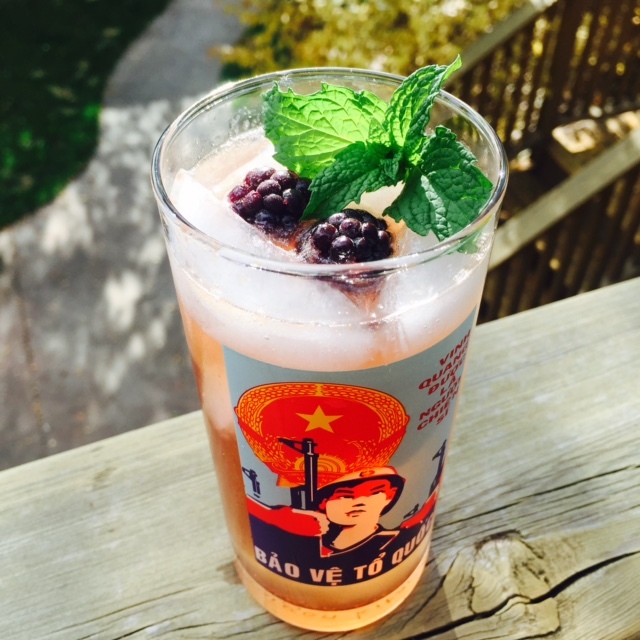 Garnish with two blackberries and a mint sprig.